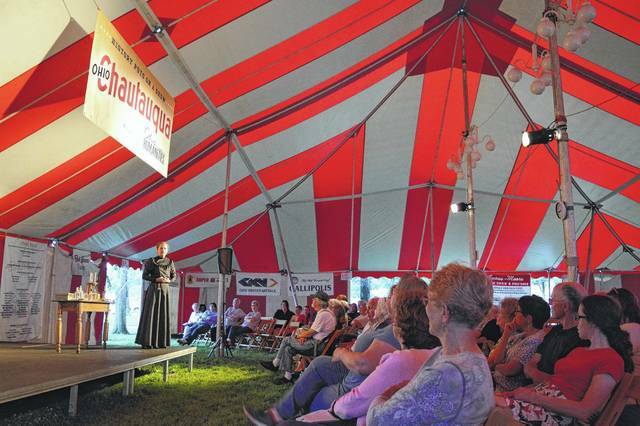 The big top tent is coming back to Gallipolis City Park in June for the Ohio Chautauqua. Pictured is a scene from a previous Chautauqua hosted in Gallipolis. Tuesday through Saturday evenings will feature another scholar presenting another character. Tuesday features Susan Marie Frontczak as Erma Bombeck. Wednesday will present Fred Blanco as Cesar Chavez. Thursday under the big top will be Dr. Sally Ann Drucker portraying Betty Friedan. Friday will have Dr. J. Holmes Armstead as Benjamin O. Davis Jr., and on Saturday Jeremy Meier will portray Robert F. Kennedy. The event is based on a 19th century tradition from Chautauqua Lake, New York and combines educational components with entertaining elements to provide historical lessons from across time and culture. Visit www.ohiohumanities.org to learn more.